I try not not make my blog too personal, preferring to focus on my home decorating and furniture restyling work. Having said this, my beautiful daughter is turning 5 in 2 weeks. I've last minute decided to have a Tinker Bell fairy party for her and 5 of her little girlfriends from preschool. I say last minute because usually I plan for 2 months (not 2 weeks) for these sort of things! So technically...., any party related posts are actually creative DIY posts. :) Do I get away with that? 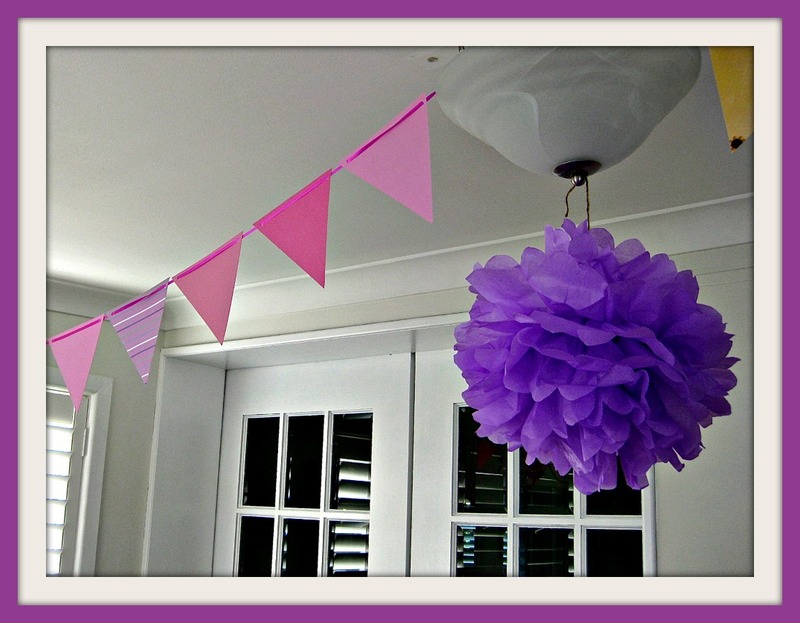 Okay, so I've started already and made a couple of large purple pompoms from tissue paper. And, being a retired scrapbooker, I had a lot of pretty card stock which I cut up last night and made into a fairy flag bunting and hung it the entire length of the room. Cost so far - $1 for the tissue paper and I have more left. Not a bad start. I plan to decorate the entire sunroom, so I'll keep you posted! Love all of these colors! She is one lucky girl! Looks like it will be a fun party too! Happy Birthday wishes to her! This is so pretty. I LOVE going all out for parties. The decor really makes people have a fun time. Can you do a tutorial on the paper flowers? I made them once with a kit and they were gorgeous. I bought some tissue paper and tried again and they were a total flop. :S I can't figure out what I did wrong. Main Bedroom Restyled .... Again!